"There is good luck, and there is bad luck, and then there's the ambiguous sort of luck that's a lot of this and some of the other." Philip Lawrence, a robust and pleasure-loving furniture-maker, dies suddenly at the age of forty-six. Though that's terribly young by most standards, he's lucky to have passed presumably peacefully in his sleep. Less fortunate, however, are the three women he leaves behind to make sense of his loss. There's Nora, his wife of seventeen years, who wakes up next to his dead body. A fiery visual artist, Nora's feminist re-interpretation of biblical themes stoked fundamentalist outrage from her small-town neighbours. Now, as her emotions run the gamut, she must confront solo life in a place she despises. Nora shares the house with Sophie, a buxom and bossy redhead, who works as the couple's housekeeper and personal assistant. A recovering virtue addict, Sophie turns to menial tasks as a way to suppress painful memories of her two-year stint as an overseas aid worker. Philip's death leaves her quietly reeling. And then there's the pliable and vacuous Beth, a former beauty queen, who serves as Nora's live-in muse and model. She mourns not Philip so much as the loss of a haven from her own creepy past. The novel follows the three days immediately after Philip's death. Privately, each woman deals with memories and emotions, secrets and uncomfortable revelations, while at the same time preparing for the public rituals of mourning (including a funeral like no other). The narrative moves seamlessly from one perspective to another with delicious dark humour and wry insight into the nature of death, love, mourning, fundamentalism and luck. 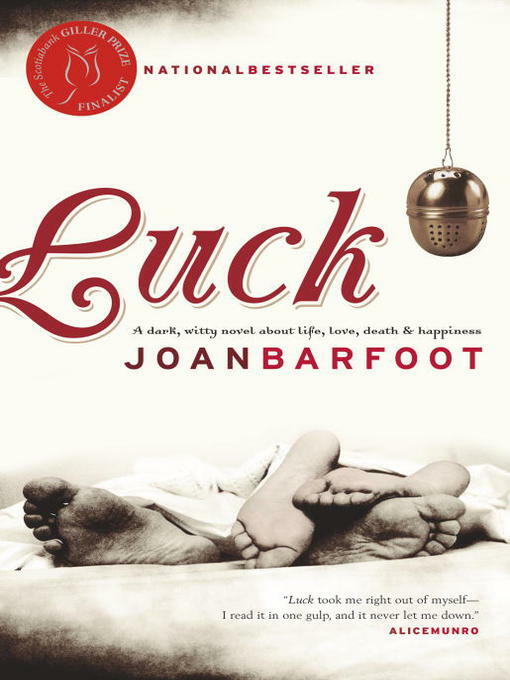 Barfoot's tenth novel, Luck was shortlisted for the 2005 Scotiabank Giller Prize. The jury citation reads as follows: "Joan Barfoot is at the peak of her powers with this splendidly realized tragicomedy about a household in the wake of an unexpected death. With its note-perfect narration, mordant wit and wonderfully neurotic cast of characters, Luck shows how death can reveal life in all its absurdity and complexity. This scintillating comedy of manners is also a profound meditation on fate, love, and artifice."